Healthy doesn't mean flavorless: Punch up the flavor with herbs and seasonings. You can save a substantial amount of fat and calories by replacing the oil in your baked chicken recipe with a flavorful, oil-free marinade, broth or wine. While oil is traditionally used to help the meat achieve an appealing golden brown color and retain moisture, it also packs a whopping 120 calories and 14 grams of total fat in every tablespoon. Skipping the oil doesn’t have to mean sacrificing flavor, however. 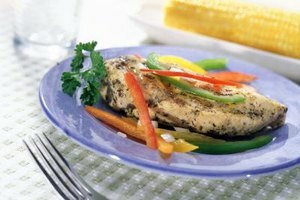 With a few tweaks to your favorite recipe, you can serve up a moist and delicious baked chicken breast that’s lower in calories, but full of flavor. Spray a baking dish cooking spray to prevent any sticking that might occur while baking. Place your chicken breasts in the dish and turn the oven on to 400 degrees Fahrenheit to start heating. Season the chicken. While a sprinkle of salt and pepper is enough, your favorite flavor combinations creates a new dish. For spicy chicken, add a little ground cayenne pepper or a few dashes of hot sauce. If you enjoy garlic and herbs, sprinkle minced garlic and chopped fresh herbs such as rosemary, parsley or thyme. Pour roughly 1/4 to 1/2 cup of broth or wine around the chicken to coat the bottom of the pan. For a little fresh citrus flavor, add some freshly squeezed lemon or lime juice to the liquid. Bake the chicken for about 30 to 35 minutes, or until a meat thermometer reads 165 degrees Fahrenheit when inserted in the thickest part of the chicken. Select bone-in chicken breasts if you're worried about ending up with dry, tough meat. 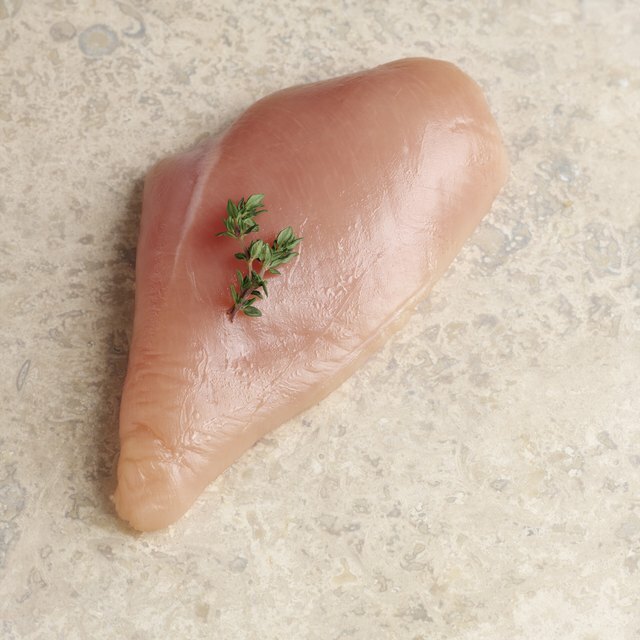 The bone insulates the chicken breast meat during the cooking process. In turn, the meat cooks slower, and moisture loss is minimized. Marinate your chicken for at least an hour before baking it for extra flavor. Oil-free marinades include a mixture of chopped ginger, red chili flakes, lemon juice, orange juice, crushed black pepper and honey. Alternatively, use your favorite vinegar with a little citrus juice and minced garlic, fresh herbs such as parsley or thyme, and salt and pepper. Add a crunchy crust to your baked chicken without using oil. Simply dredge the chicken breast in milk, Dijon mustard or a beaten egg white before coating it in bread crumbs, chopped almonds or cornmeal. Bake the coated chicken breasts at 425 degrees Fahrenheit for 35 minutes, or until the outside is golden and a meat thermometer reads 165 degrees Fahrenheit. Serious Eats: Ask the Food Lab: Do Bones Add Flavor to Meat?